1- 24 ounce package of Ghirardelli Dark Chocolate Chips (or your favorite) I like Ghirardelli for coating the strawberries best! Your choice of different colored sprinkles or grated white or dark chocolate. After strawberries are washed and dried (you can pat them dry with a paper towel) sort them out and pick the best ones for dipping. I like to use the largest ones as they look so impressive when done!!! I line 2 cookie sheets with wax paper or parchment paper and now you are ready for dipping!!! Fill a 1 cup glass measuring cup with 3/4 cup of chocolate chips. Put in microwave for about 1 minute…take out and stir again. Put back in microwave for about 20 seconds…take out and stir. Put back in microwave for about 20 seconds…take out and stir again. The chocolate chips may not be completely melted but stir vigorously to see if they will finish melting in the hot glass measuring cup. If needed you can microwave another 15 seconds until smooth and shinny. Be careful because if you microwave it too long the chocolate will get hard. I use the 1 cup measuring cup because it is deep and you can dip the strawberry into the cup, coating it all around. 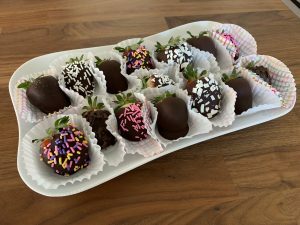 Dip each strawberry in the cup of melted chocolate and lift straight up to let the excess chocolate drip off them tilt the strawberry back slightly to catch the dripping chocolate and quickly place it on the wax paper lined cookie sheet. On the wax paper lined cookie sheet I am able to get 3 strawberries across and 4 down, so each cookie sheet will hold about 12 chocolate covered strawberries. Put in the refrigerator for about 15 minutes or until set. Continue until you have all the strawberries dipped. Store all the chocolate covered strawberries in the refrigerator until ready to serve. You can serve them on a fancy platter or put each strawberry in a paper cup. I use the paper cups that you buy for cup cakes. They have so many decorative paper cups to choose from and you can pick one that is just right for any occasion.